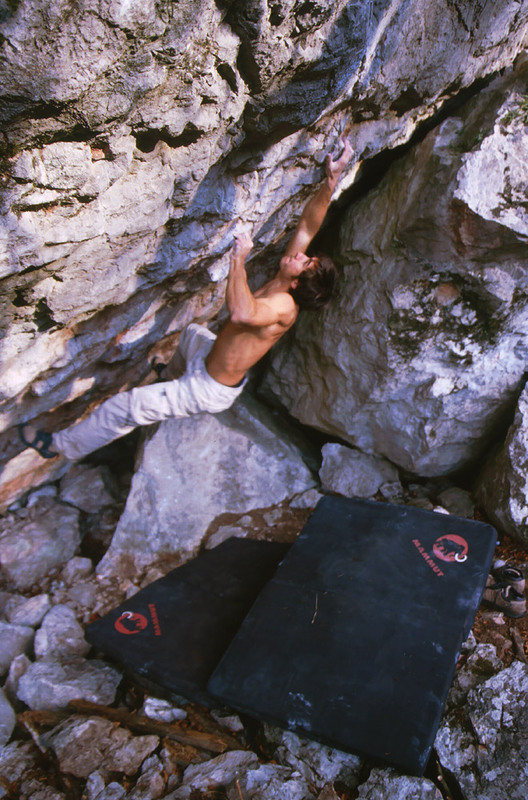 I've heard the weirdest rumors about a boulder problem called Crusher, in Mixnitz, Austria. As the first ascentionist of this line, I'd finally like to let you guys know how this problem was originally done. 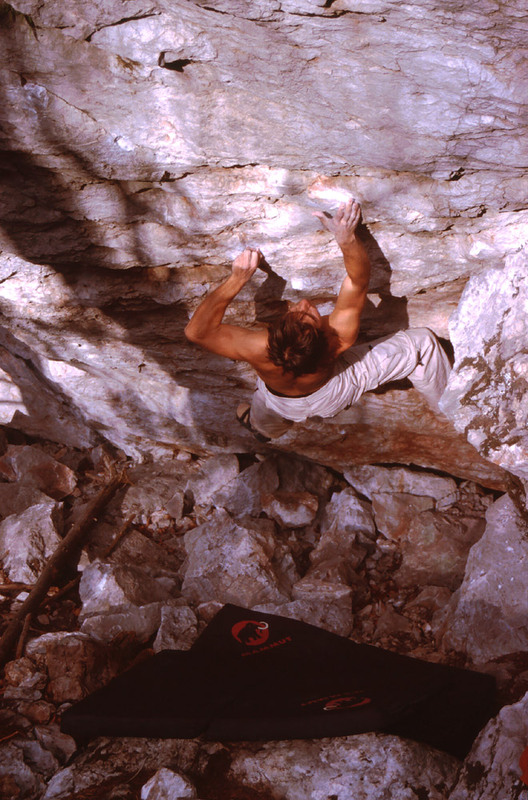 In the fall of 2006 I was working on a movie project called Enlightenment, in which I was supposed to work on a photogenic bouldering project somewhere in a forest under the golden-brown leaves. 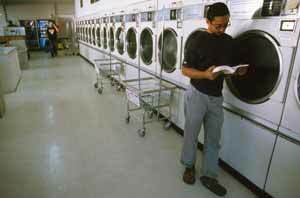 I picked a line I had discovered a few weeks prior to the film shooting and which I had tried a few times before. 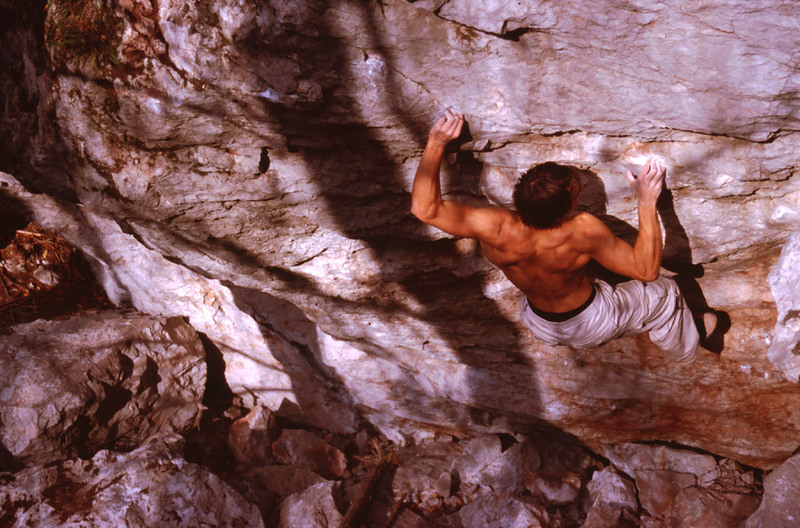 For me, the crux had always been the 2nd move: A dyno to a bad pinch with the right hand. The Crusher had been chipped. There are 2 new footholds on the climb. The first one is a good incut edge for the right foot making the second move significantly easier. The second foothold is a pocket for the left foot what had been made bigger so you can now get your toes in. This means you can take the 3rd hold as an intermadiate and skip the crazy knee-drop I had to do on the video. This is sad, because the original way was really cool. The new solution dropped the grade to something around fb 8a... 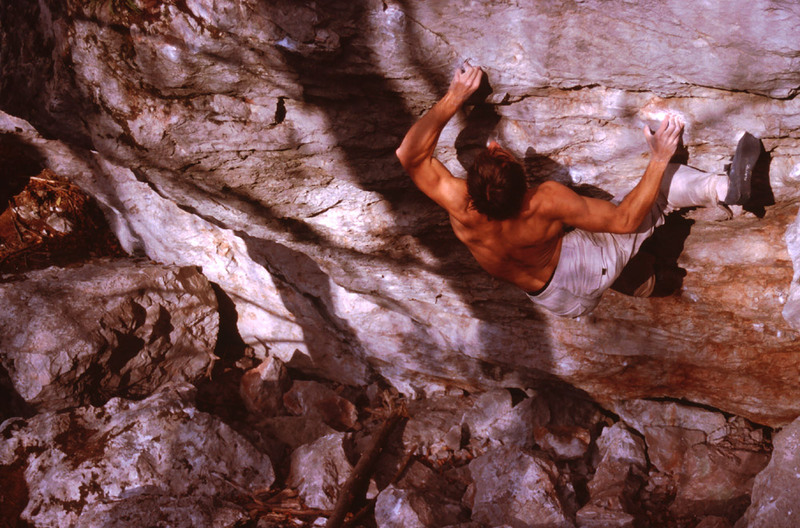 If you want the 8b tick, you have to do it the original way! Later, I heard that the chipping doesn't matter anyway because Chrusher has an manufactured hold. This is definitely NOT the case. There is a small crimp for your left hand which has been reenforced with some glue, but it has always been there and was strong enough to hold a climbers body weight. When we worked on the landig area and dug out new problems we just wanted to make sure this crimp won't come off within the next years. Cheers and cu at the boulders!